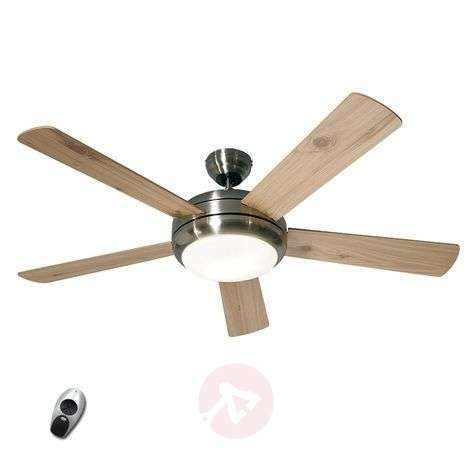 With its attractive brushed chrome and pine or beech wood design, this ceiling fan with its reversible blades fits perfectly into modern interiors, where it acts as a decorative accessory. The wireless remote control provided controls the motor (three levels) and lighting (dimming possible). A sliding switch can be used to switch between forward and reverse mode. This allows the room to be wonderfully refreshed in the summer, whilst the fan contributes to heating cost savings in the winter due to the even circulation of the heated ambient air. Runs particularly quietly and is therefore suitable for use in bedrooms and other relaxation areas. When the power to the unit is switched on, does the light come on automatically or does one then need to use the remote control to switch the light on? The light is turned on/off from the remote control. There are buttons for the fan and a separate one to turn the light on/off.